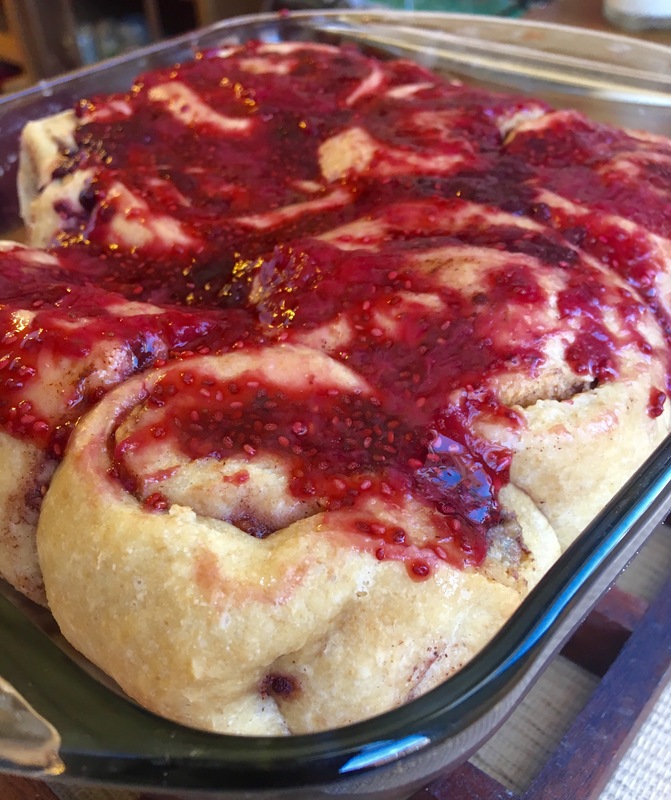 PB & Jam Cinnamon Rolls are here. Hey there, dear friend. How are you?! How is your summer going so far? Good? I hope so. 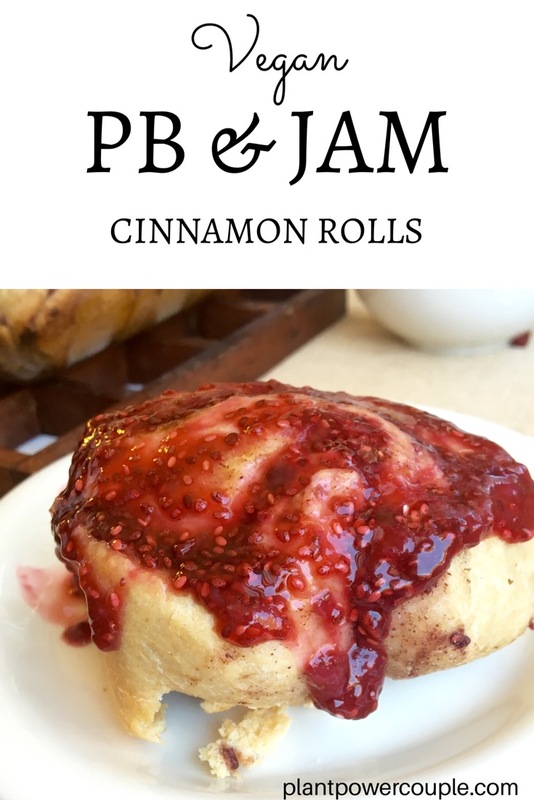 I also hope to make it just a little more delicious with this recipe for PB & Jam Cinnamon Rolls. 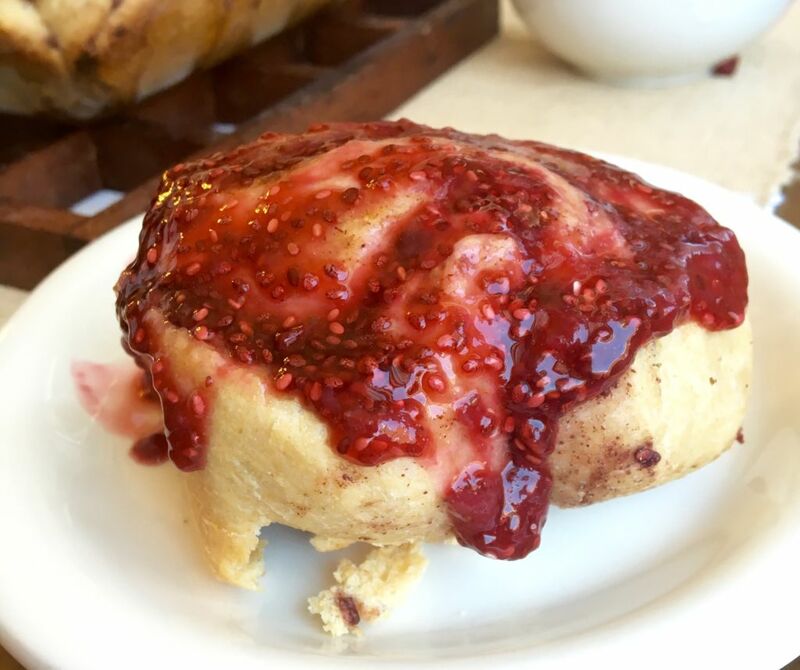 Ever since we shared our recipe for Cinnamon Rolls with Cranberry Chia Jam, I have been DYING to make a PB & J version because PB&J + cinnamon rolls = HELLO, epic deliciousness.🙋🏻🙋🏻 Please and thank you. 3. And – obviously – the peanut butter!!!! Isn’t peanut butter just the best? 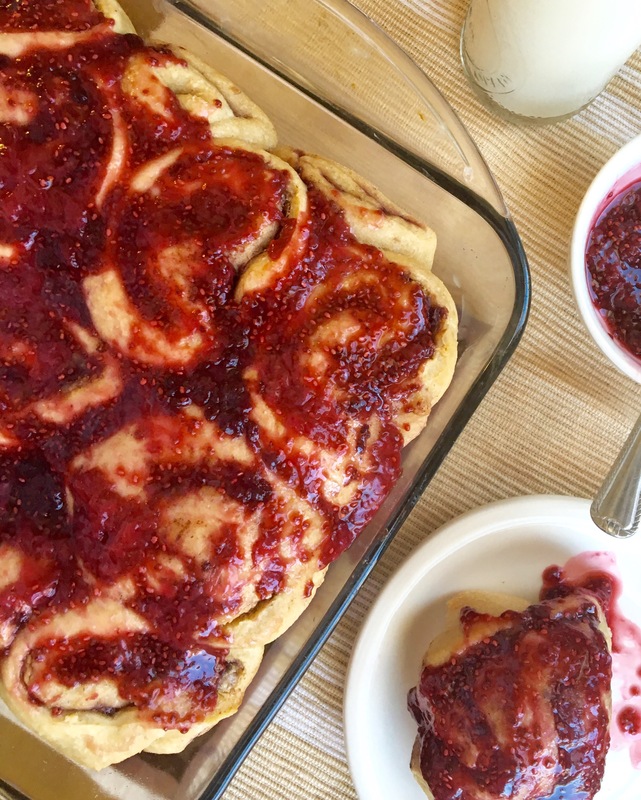 These PB&Jam Cinnamon Rolls would be AWESOME as a lazy weekend brunch. You can even make them the night before and heat ’em up in the morning. They’d also be a FAAAABULOUS treat to bring with you to work or school for sharing and a little culinary activism because no one – and I mean NO ONE – can doubt the awesomeness of vegan food after tasting these guys. Do you want to make this recipe with us LIVE? Like, us in our kitchen, you in yours, making delicious vegan treats, drinking wine, and talking about how much we love food? 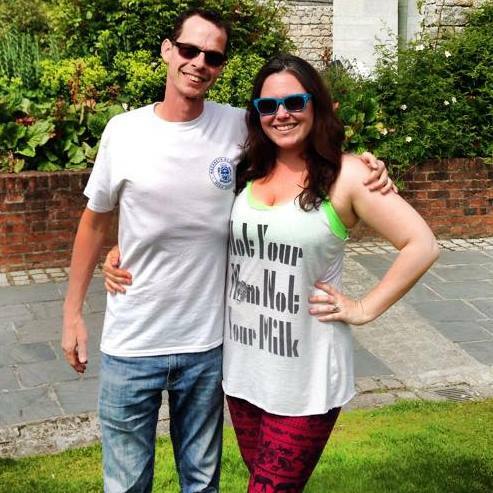 If the answer is yes, first – I love you and think you’re a wonderful human being with impeccable judgement. And second, grab the ingredients in the recipe below and meet us on the Plant Power Couple Facebook page tomorrow (Wednesday 6/7) at 8PM EST. In addition to the ingredients, you’ll need a medium sauce pot, large mixing bowl and spoon, and a 9×9 casserole dish. Can’t wait to see you there! First, make your chia jam: Add all ingredients (except chia seeds) to a medium sauce pan and bring to a boil. Allow the mixture to simmer - uncovered - for 7 - 10 minutes. Then, turn off the heat and use a potato masher or the back of a large spoon to mash the berries. Stir in your chia seeds and allow the jam to cool in the fridge whilst you make the dough). It will thicken as it cools. Make your flax egg by mixing the ground flax and water in a small bowl. Set this aside to thicken. In a large mixing bowl, whisk 1 cup of the whole wheat flour with the all-purpose flour, yeast, salt, salt, and sugar. Use a large wooden spoon to make a well in the center of your mixture and pour in the melted coconut oil, non-dairy milk, water, and the flax egg. Stir together until combined. Add another 1/2 cup of the wheat flour. Stir to combine as much as possible. Check the dough. If it's still pretty sticky to touch (big clumps are sticking to your fingers when you try to knead it), add a little more wheat flour - 1 Tbsp at a time - until the dough is soft but not sticking to your fingers in large clumps. You can add up to 1/2 cup of the wheat flour. Get in there and knead your dough for 2-3 minutes until fully combined. Then, spread a little extra coconut oil in your mixing bowl and place the dough in there to proof for 10 minutes, covered with a damp kitchen towel. Using a lightly floured surface and rolling pin, roll out your dough into a roughly 15x10 inch rectangle. Carefully spread the 1/2 cup of peanut butter over the entire rectangle. Then, sprinkle the 1 Tbsp of cinnamon on top. Next, spread 1/2 cup of the chia jam for the final layer of deliciousness. Time to roll 'em! Starting at the bottom of the longer side, tightly roll your dough up into a long log. Use a serrated knife to gently cut it into 10 - 12 pieces. Grease a 9x9 inch casserole dish with coconut oil and place your cinnamon rolls in it - cut-side up. You want them all to be touching to help rise properly. Cover the rolls with a damp kitchen towel and let sit 30 minutes. Towards the end of the 30 minutes, get your oven pre-heating to 325F. When the rolls are ready to bake, cover the casserole dish (we use tin foil for this) and bake at 325F for 20 minutes. Serve them hot with a generous slather of chia jam - enjoy the hell outta them! If you'd like to make this a little faster, feel free to use your favorite store-bought jam rather than the chia jam. 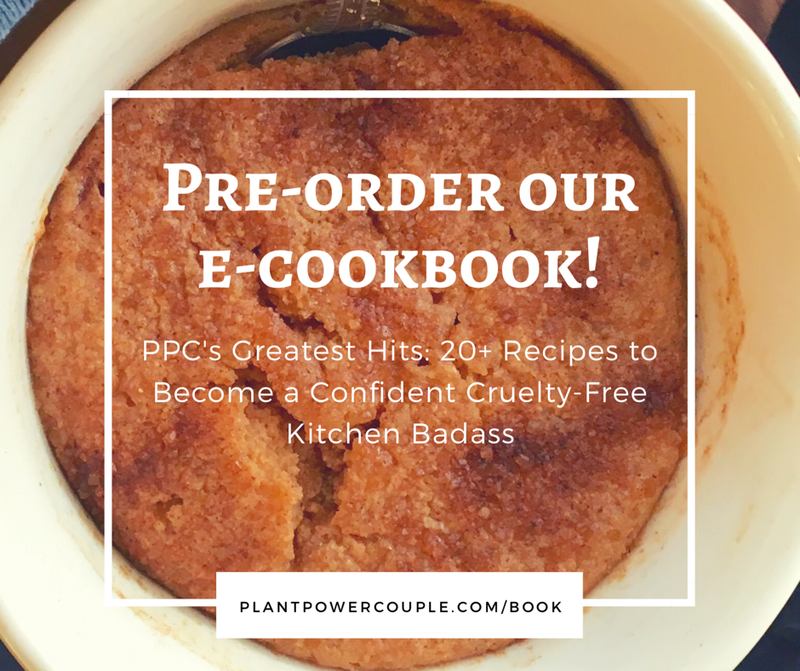 And if you liked this recipe, you’ll LOVE the recipes in our upcoming e-cookbook. Click here to get more details and pre-order at a discount.